This week’s illumination, I Am My Beloved’s, is in many ways a continuation of the illumination on the previous page, Garden of Desire, which we looked at last week. Similar to the garden, this illumination has the boundaries around the edge. In this image, however, that edge is softened, rather than the strict boundary that we saw on the preceding page. So too, are our hearts softened by the words of this beautiful passage from the Song of Songs. “I am my beloved’s and my beloved is mine; he pastures his flock among the lilies” (6:3). These words, which are placed in gold among the bright red of the illumination, jump out at me as soon as I lay my eyes on the page. 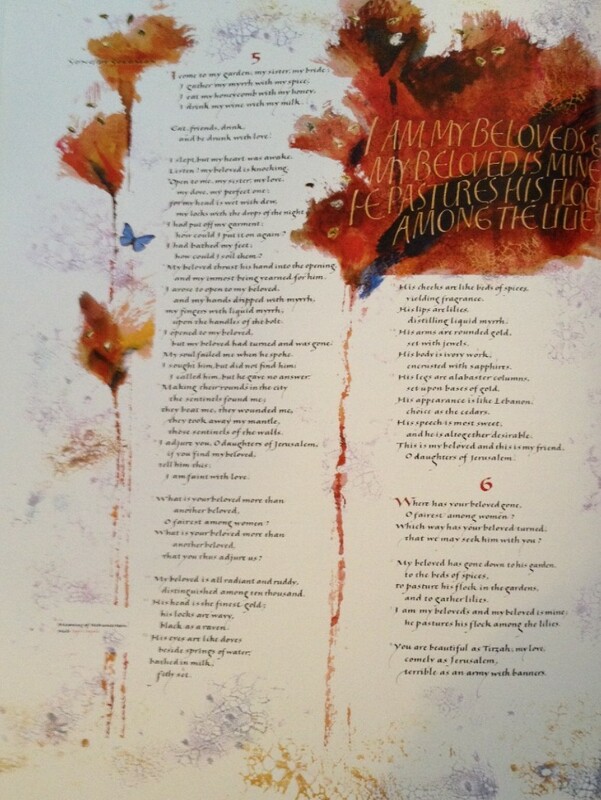 Next, I find my eyes drawn downward following the stems of the lilies that trickle down the page. The sensation of my eyes drawn downward leaves me with the sense of being almost lost in the illumination. It is easy to relate to the sense of feeling lost when you have experienced love. How easy it is, especially in new love, to be so completely consumed by the emotion that suddenly that person is all you can think about. Your heart always desires the next time you can be with that person. As my eyes go down to the bottom of the page, I notice the delicate lace imprint that makes up the soft boundary of the page. My eyes follow it around to corner of the page and then begin to climb up, noticing first the butterflies, which are so detailed and intricate in the midst of this abstract piece. I notice the blossoms of the flowers. And finally, I am brought back to the center, to the beautiful burst of color with gold, red, pink, and even a small smudge of blue. I move past the words and into the colors, and rest. Allow yourself to experience the grace of that rest embrace of God. The medieval Benedictine and founder of the Cistercian movement, Bernard of Clairvaux, had a deep love for the Song of Songs and gave a series of homilies on it. He relates to that moment of union in the form of a kiss, the kiss that comes with the incarnation. He writes, “The mouth which kisses signifies the Word who assumes human nature; the flesh which is assumed in the recipient of the kiss; the kiss, which is of both giver and receiver, is the Person which is of both, the Mediator between God and man, the Man Christ Jesus…Oh happy kiss, and wonder of amazing self-humbling which is not a mere meeting of lips, but union of God with man.” (Sermon II, On the Kiss, II.3) Bernard believed that our desire for union with God comes from our love for God. Our desire will only be satiated when we are united. The kiss that Bernard describes is God uniting with human kind. We praise and thank God for the gift of that union, which we have so recently realized the full meaning of in Christ’s dying and rising. May we continue to relish in the beauty of that kiss. 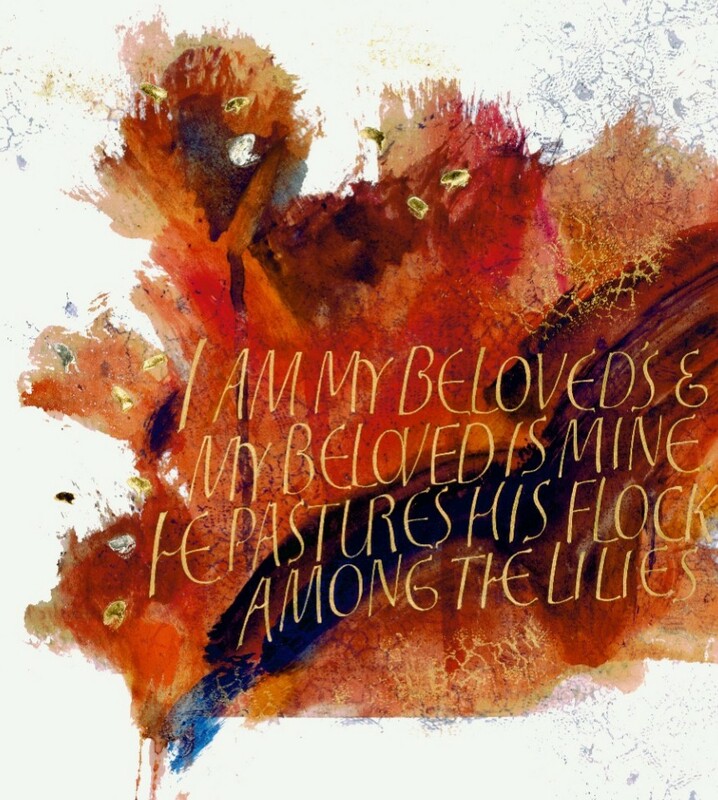 I Am My Beloved’s, Donald Jackson, Copyright 2006, The Saint John’s Bible, Saint John’s University, Collegeville, Minnesota, USA., Used by permission. All rights reserved. This entry was posted in Easter Reflection 2014, General and tagged I Am My Beloveds by Seeing the Word Team. Bookmark the permalink.